It isn't easy taking pictures of birds in flight. Anytime you point your camera toward the sky you get back lighting, that usually means what you are taking a picture of will turnout too dark. Of course there is also the problem of a blurry picture if you don't have the shutter speed set properly. When everything works out you do end up with some great pictures and sometimes a few unusual pictures as well. The above picture was taken with a Nikon D90 at 1/400s shutter speed. The ISO was 200 which is the sweet spot for the D90. 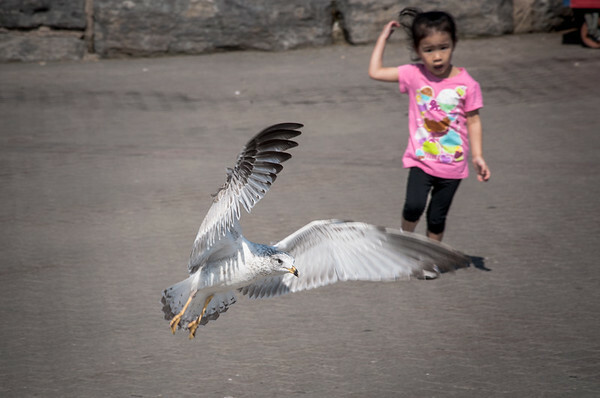 The little girl was chasing the gull around until he took flight to get away. Photographed at Niagara Falls, Canada. For every good picture I have of a gull in flight, I have 10 others that are worthless. You have to learn to track the birds and keep them in full frame, and that is easier said than done. It is easier if the bird is flying toward you but then you miss out on some other good shots. Gulls are a medium sized bird and can hover which gives you a good opportunity to get a good picture.